The US began building fire towers shortly after the forest service was founded, after the Great Fire of 1910, which turned about three million acres of forest in Washington, Idaho, and Montana into ash. The newly founded forest service knew that they had to do something to prevent fires like that from breaking out again. Many rules and policies were put into effect about preventing forest fires that are still used today. One of the rules was that towns had to pay for the contracting of fire suppression services. This was the major reason why the fire towers were built. Seven years earlier, in New Hampshire, the Society for the Protection of NH Forests reported that spring to be very dry. Very little rain had fallen for forty days. There had also been much logging, which had left dry branches and wood on the mountainsides. Many fires were started by locomotives and lightning. Because the fire detection back then was not effective and there were not any good communication systems, a quarter million acres of forest burned to the ground that year from over five hundred fires. Shortly after this disaster, the Mt. Pleasant Hotel Company built a fire tower on Mt. Rosebrook, which had already been burned in the fires. In 1909, the state began to fund the construction of towers with extra funds left over from fighting fires. They purchased telephones and wire for five new towers. The Appalachian Mountain Club allowed an abandoned hotel on Mt. Kearsarge North to be used as a lookout station. Most of the early fire towers were made out of logs, or were not even towers at all, but simply lookouts on pre-existing mountaintop hotels. In 1910 the NH Timberland Owners Association, the state of New Hampshire, and the US Forest Service worked together to produce a system of fire towers in the White Mountains. That year, ten new towers were constructed, three of which were on pre-existing hotels or stations. The other seven, established on mountains Magalloway, Sugarloaf, Signal, Cambridge Black, Pine, Carrigain, and Osceola, were paid for by the NH Timberland Owners Association. The NHTOA and the state continued to build more towers, having a combined total of twenty-nine by 1917, while the US Forest service continued to run just two. A few years later, the state started taking down the wood and log structures and erecting new, more durable steel towers in their place. Soon, fire towers became an attraction to the public. Hikers would climb them to enjoy the views. Trails were blazed to the towers and dangerous ladders were replaced with safer stairs. This also prompted the US Forest Service to produce cards to give to the public that signified someone had visited a tower as part of a program to get the public to support forest fire prevention. A large number of the towers were destroyed in the 1938 hurricane, and new, more durable towers replaced them, along with eleven new towers. During World War II, some were used for enemy aircraft detection. Fire towers continued to keep watch and protect the forests until after World War II, when airplane fire detection was starting to be used. The towers owned by the Forest Service, now seventeen, were all destroyed by 1970. Many abandoned towers were labeled hazardous and were also destroyed. By 1982, only fourteen towers were operational, and on June 9, 1983, all of the remaining towers were closed. The age of fire towers was over. The next year, the towers returned to operation, but only part-time. In 1992, sixteen towers were considered active, and still are today. Sadly, only about thirty of the over eighty towers that were built remain. The sixteen that are considered active by the state can be visited through either hiking trails or roads, with the exception of one, on private property. Nine have been converted into viewing towers, and five others still standing have met with various fates: The towers on East Whitcomb and Signal remain lost in the forest; North Deer Mountain is visited by a hiking trail but has had its stairs removed; Carter Tower stands a padlocked relic on the side of Route 2 in Jefferson; and Bear Island's tower was converted to a chapel. Amazingly, twelve of those thirty-one that are still around were first built as part of the original project in 1910. Remnants of the fifty-five others still exist in places. Cement footings can still be seen on top of many popular mountains, and some debris still can be found on top of some forested hills. 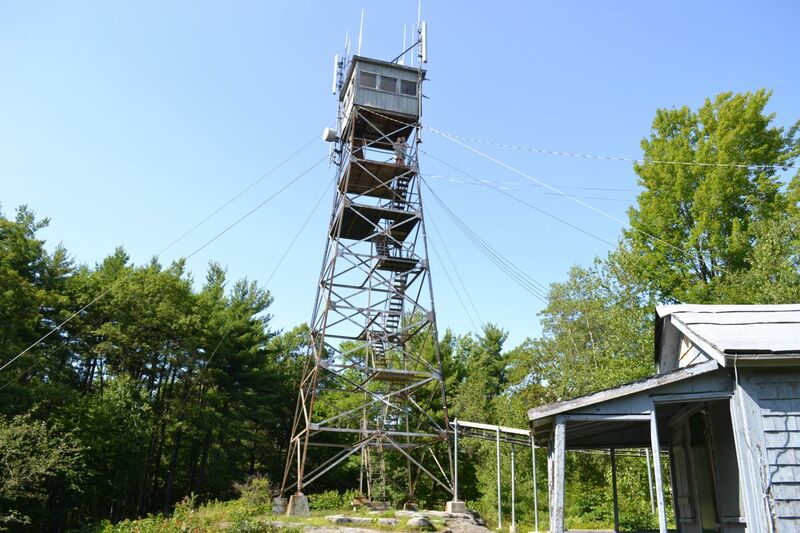 Together they preserve the fascinating history of New Hampshire fire towers. Interested in New Hampshire fire towers? Below is a list of all known fire tower sites in New Hampshire, with links to the ones on NH Family Hikes. Get history about each one on the official state fire tower listing page. Earn a patch from the NHDFL by visiting at least five of the towers in the "Active Fire Towers" section. Fifteen of these are available to be visited, while one, Croydon Peak (marked with "**"), is within Corbin Park, owned by a private hunting club which denies access to the public. The list shown here has been slightly modified and re-ordered from its original form, as created by Ed Hawkins, unquestionably the greatest modern-day New England hiker, who based it on the research of Iris Baird. Hawkins offers his own achievement patch to anyone who completes his entire list (all five sections shown below). This impressive task has so far only been accomplished by around 20 hikers. See details here! Note: tower sites marked with "**" are excluded from the Hawkins list for various reasons.